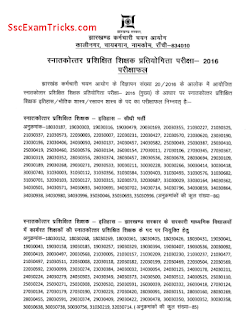 Latest news of 29th August 2018 - Jharkhand Staff Selection Commission post graduate teacher competitive exam final result has been declared for Sanskrit English Geography economics an official website. Those candidates who have attended written test held from 5th to 27th March 2018 they can download their final result from the link given here. · Age Relaxation will be given to the native candidates of Jharkhand only. Post Graduate with 55% in respective subject with degree certificate of B.Ed. The good news is that Jharkhand Staff Selection Board has uploaded the result of PGT Mains Exam 2016 on official website. Earlier JSSC had conducted PGT Main Examination on for the posts of 513 PGTs under direct recruitment advertisement number 20/2016. The main exam result for the subjects of History, Physics and Chemistry has been published. Those candidates who had attended the examination and now waiting for the declaration of result; they can download their result in which roll numbers are mentioned from the direct link given here. 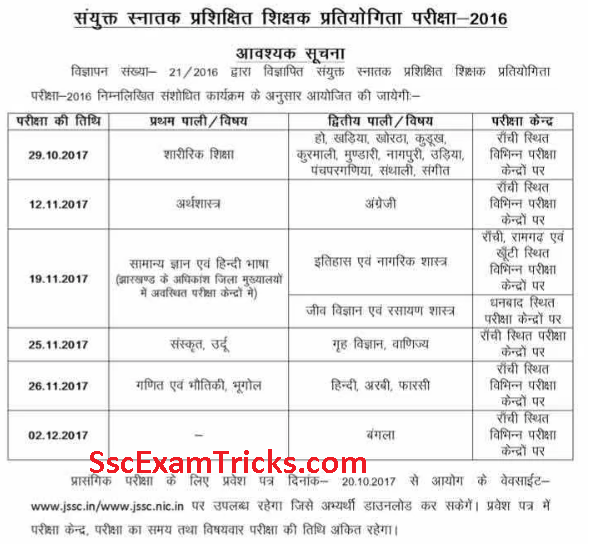 Jharkhand Staff Selection Commission is working on uploading JSSC TGT Admit card 2017 at least two weeks before the exam date. The combined trained graduate competitive exam will tentatively held in June/July 2017. Earlier JSSC had notified on 27 December 2017 for recruitment of 17572 posts of TGT teacher across the state. The submitting online application forms was started on 06th January 2017 and ended on 05 February 2017 at www.jssc.in. Huge numbers of candidates had applied and ready to attend the competitive exam. Based on the score of Paper II, district wise cut off marks will be prepared and JSSC TGT Final Merit list will be released on official website www.jssc.in. The qualified candidates will face interview in order to get finally selected for the advertised posts. · Visit to the official website and look for link to be displayed as ‘JSSC Hall Ticket 2017’. 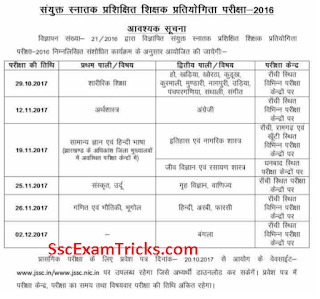 · Enter registration number and DOB for downloading your online JSSC Call letter 2017. This admit card will be valid with photo identity proof of the candidates. So don’t forget to bring the same into the examination hall.